We at PSB, and all indie booksellers I’d wager, are always brainstorming for ways to engage with our community of writers - published, non-published, self-published, aspiring – in a meaningful and mutually beneficial way. We, actually our marketing team, have hit on something that may not be novel in the literary world, but may be in the context of a bookstore.That is a Writer in Residence program. The idea was first hatched back in January 2018. Management was unanimously behind it and requests for proposals went out to the public in June. The response was overwhelming. Read more about the program HERE. If this sounds like something you might want to institute in your bookstore, feel free to contact us. Four SIBA booksellers selected in the Book Industry Charitable (Binc) Foundation’s 2018 Higher Education Scholarship Program! The recipients were selected from 159 applicants comprised of bookstore owners, booksellers, former Borders Books employees, or their dependents. In total, $109,000 was awarded to help booksellers from 23 stores in 21 states reach their educational goals at 27 different schools. Four of the recipients are SIBA booksellers: Abigail Parkes of FoxTale Book Shoppe in Woodstock, GA, Hannah Richardson of Malaprop's Bookstore/Cafe in Asheville, NC, Sarah Skinner of Island Bookstore in Duck, NC, and Julie Wade of Downtown Books & News in Asheville, NC. A list of scholarship recipients, including their goals and favorite books, can be found here. Information about how bookstore employees can apply for the 2019 Higher Education Scholarship Program will be released early next year. The New York Times Best-Seller Lists, posted on the web on Wednesday nights and published every Sunday in the print Book Review, reflect sales reported by vendors offering a wide range of general interest titles. The sales venues for print books include independent book retailers; national, regional and local chains; online and multimedia entertainment retailers; supermarkets, university, gift and discount department stores; and newsstands. It’s increasingly important for independent booksellers to make their voices heard on a national level. Please, demonstrate the importance of the indie sales channel by reporting your sales to this important national outlet for book news. If you do not yet report your sales to the New York Times, you can submit a request for an application at https://bestsellers.nytimes.com/newstoreapp. If accepted, you would be expected to send your confidential report with sales from the previous Sunday-to-Saturday period by noon on Tuesday Eastern time each week. Every Tuesday, you’ll receive an email letting you know what titles will be covered in the Book Review that weekend, giving you advance notice to order these titles for your loyal readers. The Times Digest with the pdf containing the Best-Seller Lists hours before they appear online and 10 days before they are listed in the print Book Review. A complimentary copy of the printed Book Review sent directly to your store. SIBA's Collective Clout is Bustin' Out! Over 80% of SIBA’s bookstore members report to the New York Times Bestseller List, review books on Edelweiss, submitting to IndieNext, publishers, and SIBA plus maintain an extensive local media list. Over 90% report to the ABA Indie Bestseller List. Combined our southern bookstores support over 1100 book clubs across the south reaching thousands of southern readers. The themes for these book clubs run the gamut and include: Adult, Children, YA, YA for adults, Signed 1st Edition Clubs, Teen, Black Feminist Fiction, Sci Fi, Political, Mystery, Classic, Literary Fiction, Historical Fiction, International Literature, Women’s Voices, “Monday Morning”, Romance, Spanish, Small Press, Social Justice and many more. SIBA stores combined have over 500,000 Facebook friends, over 300,000 Instagram, and over 200,000 Twitter followers. In addition, SIBA and her stores email nearly 500,000 readers regularly. SIBA’s social network reach is 22,000 on Facebook, 5000 on Twitter, and 1000 on Instagram making the total reach of SIBA and her stores well over one million! Over 60% of SIBA bookstores attend the SIBA Discovery Show sending more and more booksellers every year increasing attendance by 10% on average since 2014. We can carry this momentum forward into the future and imagine a day where we determine to send a message out to our million+ southern readers! 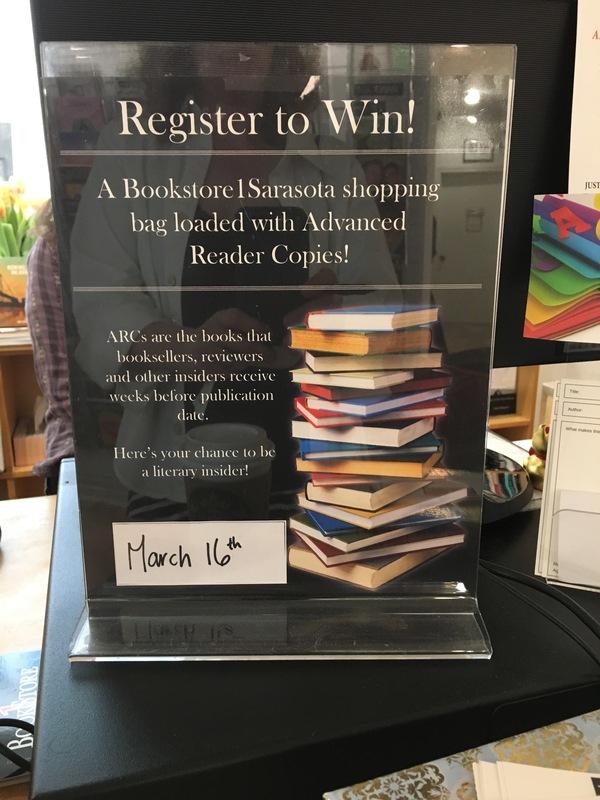 Make ARC giveaways very exciting in a register to win program! Invite Customers to be "Literary Insiders" by gifting ARCs in raffles, with large purchases, or as a way to cultivate customer reviews for shelf-talkers and newsletters. Here's what Bookstore1 in Sarasota is doing with their ARCs."